Our Community is a strong supporter of any initiative that seeks to bring greater diversity to leadership, public life, and public debates. In particular, we are passionate about supporting women's leadership. Some of our women's leadership initiatives are outlined below. Chief Executive Women, the Male Champions of Change and Women's Leadership Institute Australia share a common goal - a significant and sustainable increase in the representation of women in leadership in Australia. Tell your team so they can support you in delivering your commitment. Extend the pledge to your own organisation by ensuring all forums you run or sponsor take gender balance into account. By taking the Panel Pledge, you will be doing your bit to ensure that women leaders achieve better representation in public life. 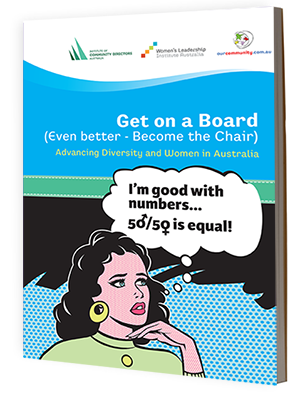 Women's Leadership Institute Australia and Our Community have partnered to publish a guide to help boost the number of women recognised through the Australia honours system. Advancing Women: Women & the Order of Australia is designed to guide people through the process of nominating women for an award. There is a largely unrecognised problem in the distribution of awards in Australia. Fewer women - many fewer women - than men are nominated, and that means that fewer women than men get the awards. Things aren't getting better, either. In fact, the trend line is going down. Of course, this is not a problem confined to the Australian honours system. Women are underrepresented in many other places in Australian society. However, this is one of the few places where it is relatively easy to redress the balance as there are already many Australian women who have made extraordinary contributions. All we need to do is ensure a larger number of these women are nominated. Australian honours represent the things that we, as a community, believe to be deserving of recognition - believe, in fact, to be honourable. We honour people who deserve it. There's no reason why women should not make up half the honours lists. If you know a woman who's doing work that you admire, put her forward for an award. Australia will thank you.